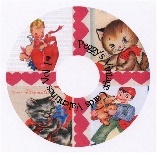 The Valentine images on this CD are from many different scrapbooks. It contains adult and children Valentines as well as the wonderful die cut cards that the kids exchange in school. This CD contains scans of 128 vintage cards with 195+ graphic images and a combined total of 392 images and sentiments. The cards on this CD date from the 1940s to the early 1960s.